The Brochure Bug is available in three formats – single-sided with three pockets, single-sided with six pockets or double-sided with an amazing twelve pockets. This ensures that you’re able to select the format that best accommodates your marketing material. All Brochure Bugs come fully equipped with mesh pockets and an aluminium base that is fitted with black end caps. 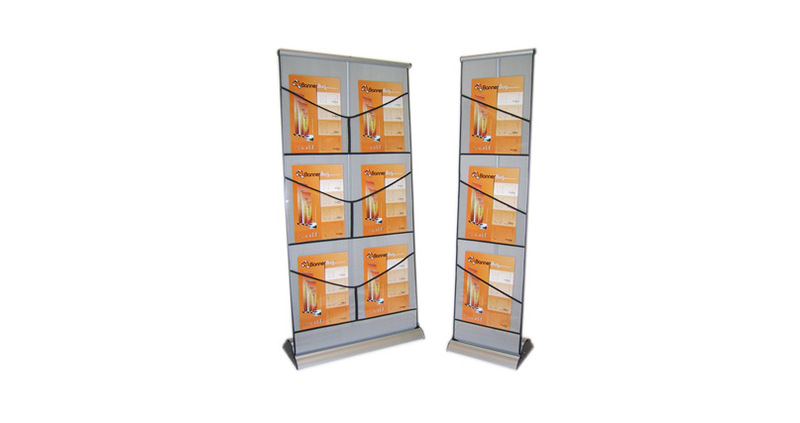 They have an extremely easy to use pull-up design – all you need to do is pull the banner up, lock the top into place and you’re good to go! To ensure that your Brochure Bug is stored and transported safely, we also supply a black padded carry bag with your order – simply place the base and banner inside. This depends on which version you opt for – the three pocket stand is 300mm x 1230mm and weighs only 2.5kg, whereas the six/twelve pocket ones are 580mm x 1230mm (the six pocket weighs 4kg and the twelve pocket weighs 5.5kg).